(A talk by Dr. Ian Beech, Academic Manager for Mental Health, Faculty of Life Sciences and Education, University of South Wales, Pontypridd). (a talk by Dr. Ian Beech, Academic Manager for Mental Health , Faculty of Life Sciences and Education, University of South Wales, Pontypridd). 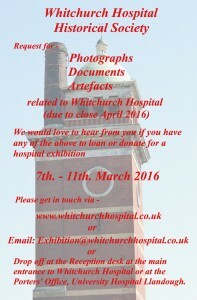 An opportunity to view another important artefact of the hospital’s long history. The embroidered tablecloth, bought in Jacob’s Market, Cardiff, in 1981, and dated ‘1917’, was made by WWI military casualties recuperating at the hospital. It includes the names of numerous staff and soldiers there at the time. It is now preserved at St. Fagan’s Museum of Welsh Life, who has kindly agreed to display the tablecloth). You are currently browsing the archives for the Exhibition category.